I have had a hard time, lately, with figuring out exactly who I am. Am I an artist? A designer? Both? Am I a good friend? Sister? Person? The one thing I do know, that I am certain of, is that I am happy. I just have so many questions that I would like to have answered, to help me live better and make better choices for myself. Does that make sense? I guess I am turning to blogging again... ages ago before I even had dreamed of Paper Relics, I had a blog called The Soul of Hope and it helped me through a dark time and I came out with new friends and a new love for creating. I am very sporadic at journaling (both online and in a journal - but here I am referring to in a journal), I do it for a few days - then stop and tear up all the pages and start again. Usually my journals are all hand written, no art or embellishments but lately that is starting to change. I also have an inspiration book that has all sorts of snippets of things I find and love, so I was thinking I could start journaling and combine all three, art, writing and inspiration - maybe I can stick with it and work through some of the questions I am pondering. 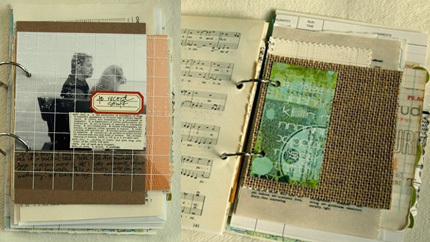 So, I just purchased this everyday vintage art journal from evalicious on etsy to start journaling again. I recently figured out my Style Statement, which is Nostalgic Creativity (more on that later), and I realized that this journal is just that, the spirt of my Style Statement - with the vintage papers and artful design, and the blank pages open to my imagination. I hope it will help me start to journal regularly... and if all goes well I can start sharing on this blog and help myself get to where I wish to be.